(Nanowerk News) New sodium-based all-solid-state batteries could enable future energy storage devices using only the easy-to-access, cheap and earth abundant elements sodium, silicon and phosphorous (Na, Si and P). By shaping them into sodium phosphidosilicates containing large supertetrahedral entities, NIM scientist Prof. Bettina Lotsch and colleagues generated solid electrolytes with very high ionic conductivity. Solid sodium ion conductors, based on the earth abundant and relatively cheap elements Na, Si and P, can be composed into sodium phosphidosilicates. These provide an intriguing structure composed of phosphidosilicate supertetrahedra surrounded by sodium ions. Professor Bettina Lotsch and colleagues analyzed six new phosphidosilicate structures and could show that with increasing size of the supertetrahedra, the conductivity of the structure also increased. The highest ionic conductivity was detected for the T5/T5-type supertetrahedral cluster. Such material is a potential solid electrolyte candidate in a sodium-based all-solid-state battery. All new structures and their properties were described in Angewandte Chemie ("Fast Sodium-Ion Conductivity in Supertetrahedral Phosphidosilicates"). 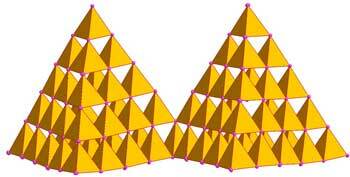 A T5/T5 supertetrahedron can be pictured as a large tetrahedron with an edge length of five SiP4 tetrahedral building units. The SiP4 units are linked by vertices and as special feature the T5 supertetrahedron lack one Si atom in its center to attain charge neutrality in its interior. The described T5 supertetrahedra are interconnected by fusing SiP4 tetrahedra at the corner of neighboring supertetrahedra. Connected in this way the supertetrahedra form interpenetrating networks of two six-membered rings resembling in a three-dimensional sphalerite-like network. The sodium cations are distributed between the supertetrahedral networks, coordinated in irregular NaPx polyhedral and only partially occupied. At the moment, all-solid-state batteries are in focus of research. They potentially offer for example higher safety and faster charging than commercial lithium ion batteries (LIBs). Because of a future shortage and high costs of lithium, sodium ion batteries are an attractive replacement for LIBs. The scientists could show that the conductivity of the sodium phosphidosilicates clearly increased with their cluster size. This could be explained by the dilution of the sodium cations, as the relative anionic charge density decreased with increasing network size. Hence, with the decreasing sodium density, the number of partially occupied sodium sites increased, which in turn then enhanced the conductivity. Within the supertetrahedral cluster, the sodium cations migrate through ion channels. The pathways connecting these channels and the channels themselves became broader with increasing size, leading to a fast, almost three-dimensional sodium migration in the T5/T5 structure. “With this background, our aim is to find more, even faster ion conductors in the new class of sodium phosphidosilicates, and to provide a new conductor material for the next generation of energy storage devices.”, tells Hatz.